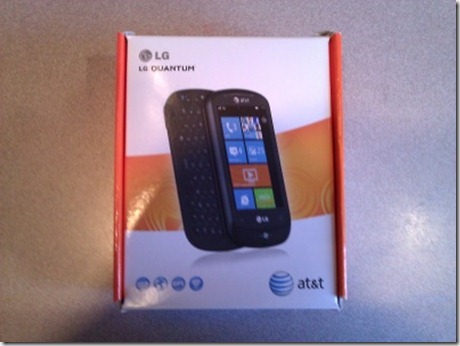 Over this past Christmas holiday weekend, I posted my review of the LG QUANTUM Windows Phone 7 phone for AT&T. At the time, I realized that I was writing a review of a new technology from the perspective of someone already somewhat intimate with the Windows Phone 7 platform. Furthermore, as a “power user”, I was not necessarily the key demographic for the Microsoft’s mobile OS “reboot”. While I did keep this in mind when writing the review and I do really love using Windows Phone 7, I thought it might be interesting to perform a bit of a “controlled experiment”. What if I could have someone closer to the target demographic for Windows Phone 7 to try the LG QUANTUM on a regular basis and get their feedback and impressions? Fortunately for me, I did not have to go far for a test subject. My lovely wife of nearly 14 years, Melissa, has been a longtime user of smartphone technology. Perhaps I should say “a longtime sufferer”, though. You see, over the years I have repeatedly convinced her to try some of the latest and greatest offerings for cell phones. For the most part, Melissa has been less than satisfied with the results. Her satisfaction level has ranged from non-existent to tolerant at best. Especially high on her frustration list has been Windows Mobile devices. Whether it was the less than stellar battery life, the occasional instability of the hardware and OS or just plain non-intuitive aspects of the device, she was always frustrated and upset – with one exception. She did have a reasonably satisfactory time with the Samsung Blackjack II running Windows Mobile 6.1 Standard Edition. However, the lack of a touch screen was a point of contention for her. Melissa most recently was using a Touch Pro 2 running Windows Phone 6.5. While the phone seemed to be fast enough, the same frustrations with battery life and the OS remained. She was pretty much at the end of her proverbial rope, telling me on more than one occasion she sometimes thought about going back to an old Motorola RAZR. At least it worked for phone functionality she way she expected. Melissa is someone who relies on her phone for voice calls first and foremost. However, she has come to rely on her phones for basic management of her calendar and other forms of communication (email and text). She is not one to constantly charge her phone; she typically puts a phone on a charger when absolutely necessary. Melissa also uses the Internet frequently for information and research, and has been using Facebook as a way to keep in touch with friends and family. In my opinion, she was the ideal candidate for “The Experiment”. I approached Melissa with the idea of using the LG QUANTUM as her primary device for a couple of weeks and then providing her feedback. She was open to the idea, I believe at least partly because based upon her current Touch Pro 2 experiences it really couldn’t get much worse So, the experiment began. This was a total “end-to-end” experience, starting with the initial setup of the device. I reset the LG QUANTUM, working with Melissa to perform the initial setup. To be honest, she really did not need me for the setup; it is a strength of Windows Phone 7 to provide a simplified initial setup experience. I did want to make sure, however, that we made it past setup without Melissa having a change of mind. After the initial setup, I basically left Melissa to her own devices (pun intended). In the past, I typically has to spend a great deal of time working with her to get her phone set up with her. This time, I decided to let her discover things for herself, and only assisted when she had specific questions. Those questions were very few. I did should her how to pin items to the home screen, and that basically gave her the greatest help in making the phone her own. This past week, I wrote some questions up for Melissa and asked her to write up some responses. She gladly agreed to participate. Overall, what were your impressions of the LG QUANTUM? As someone who is strictly an end user using this phone has been the best experience for me since. Most everything was easy to use and very intuitive. The phone itself is attractive, slim and not heavy. The size of the screen is great. The touch screen was accurate and responsive ~ the best touch screen I have ever used. What were some of the things you liked most about the phone? I love how you can pinch and zoom when reading an e-mail or browsing the internet ~ that is really awesome! The size and clarity of the screen. Compared to your previous phone (running Windows Mobile 6.5), what was the biggest change for you? Ease of use. It was very user friendly ~ relatively easy to navigate and figure things out. Usually when I get a new phone I don’t know how to change settings and set things up. 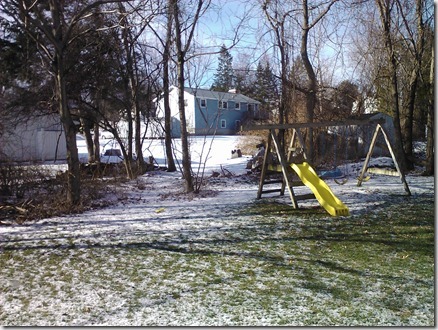 With the LG Quantum I was able to figure out quite a bit on my own before needing assistance . You are a big "physical keyboard" fan. How is the keyboard experience with the LG QUANTUM and Windows Phone 7? The keyboard is very nice and easy to use. However the small buttons on the left side for special symbols or caps is difficult to use. For example, you need to use the function key for numbers ~ with short hand texting this is a bit of a pain. Using mail was somewhat problematic for you in the past, especially with the drain on your battery. How do you like the mail experience in Windows Phone 7? The mail experience is the best I have had with any phone. Easy to tell when I have new mail ~ easy to read and respond. Speaking of battery, how has the battery life been on the LG QUANTUM? The battery life is excellent! I am able to check e-mail and use the internet without needing to charge my battery during the day. That is important to me as I am often on the go and not able to recharge my phone for long periods of time. What did you think about how you could "personalize" the device (colors, tiles, etc)? It would be nice if there were more options for “personalizing” the device. As someone who is strictly an end user, I like to be able to change the look of my device based on seasons/moods, etc. There are not very many options for that. Most especially the colors for the text messages. I also like to have “fun” ringtones and the choices provided with this phone are not great. What has been your biggest "dislike" so far? Sometimes when I go into contacts and try to call a number it doesn’t work and I have to back out and re-try. Melissa was not the only person with observations during her usage, by the way. As the person who serves as her “Familial Help Desk” and the creator of this experiment, I was keen to keep track of things. Here are some of my observations. I really did not have to provide Melissa with much assistance when it came to using the LG QUANTUM. Melissa’s usage did NOT include games or media. When we initially set up the LG QUANTUM, I considered rushing straight to setting up the phone with music and videos, and perhaps a game or two from the Windows Phone Marketplace. I quickly decided to hold on that, figuring I would save that as a sort of “trump card” if Melissa wasn’t pleased or wowed by the phone. Melissa is a Zune user and occasionally would play games on her prior phones. I never heard Melissa use the words “love” and “my phone” in the same sentence – until now. I really mean this. Melissa has always “tolerated” cell phones. When describing the LG QUANTUM to myself and others, she will invariably say “I LOVE this phone.” In my case, she has said “Have I told you how much I love this phone?” on an almost daily basis. Knowing my wife the way I do, these statements are by far the greatest compliment that can be made to both LG for the QUANTUM and Microsoft for Windows Phone 7. I often wondered if Melissa would ever come to enjoy using a smartphone; now I know she can (and does). As someone who is deeply immersed in mobile technology as a user and a writer, it is nice to be able to really get detailed perspectives from others that are not like myself. Sure, I get the occasional feedback in brief conversations, emails or forum posts. But getting to watch someone use a technology on a daily basis and provide constant feedback really gives me the chance to objectively judge the success of a technology in the hands of a person for whom the technology is primarily intended. When it comes to the LG QUANTUM and Windows Phone 7, I can say based upon my little experiment that both LG and Microsoft have winners on their hands. The BostonPocketPC.com After-Holiday Contest is now over. After gathering the list of entrants, assigning numbers to the entries and using our favorite contest tool (Random.org), the winner is – Jim Travis! Jim is a longtime participant in the Boston/New England Windows Phone User and Developer Groups (I believe Jim has been attending sine the days when we were Club Pocket PC – Boston) and has also provided comments and feedback right here at BostonPocketPC.com. Thanks go to all those who participated in the contest. Congratulations go to Jim, who should be receiving his new phone shortly. And don’t forget – if you are interested in learning more about the LG QUANTUM Windows Phone 7 phone, my full review is available right here at BostonPocketPC.com! After-Holiday Contest - Win an AT&T LG QUANTUM! Well, the holiday shopping period has come and gone here in the US. Of course, this can only mean one thing – the After-Holiday Shopping Period has begun! The mall and store parking lots are packed with shoppers carrying newspaper flyers and printed web pages, all containing deep discounts on merchandise. If you are not up for more store or mall chaos, or the weather outside is truly frightful, we here at BostonPocketPC.com have another way to get a great product at the greatest of prices – FREE! Thanks to the folks at LG, we will be giving away an AT&T LG QUANTUM running Windows Phone 7. This contest is only open to residents of the United States (sorry about this, folks). The winner of the contest will need to provide a valid US shipping address. 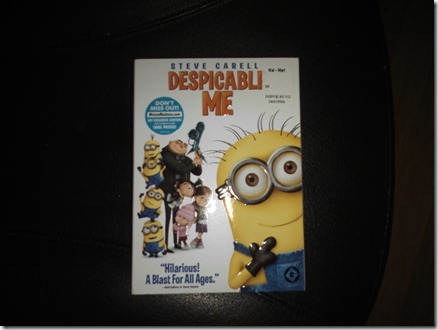 This contest is considered open until 11:59 PM Eastern Standard Time on January 1st, 2011. All entries after this date will be considered invalid. To participate, you will first need to visit the BostonPocketPC.com Official Facebook Page. Once there, you will need to “Like” the page in order to participate. Read up on the LG QUANTUM. You can read from the BostonPocketPC.com review, or visit LG’s Mobile Global Facebook page (if you visit the LG Facebook page, please support LG in supporting this contest by liking them as well). Once you have liked the BostonPocketPC Facebook page and done your homework, click on the “Discussions” tab on the BostonPocketPC Facebook page. 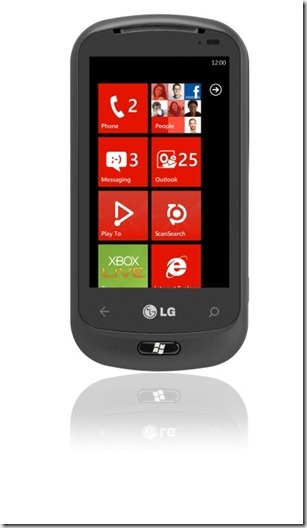 There you will find the discussion topic “What do *you* like best about the LG QUANTUM with Windows Phone 7?”. To enter the contest, simply post your reply to this question. Entries are limited to one per person. Only the original reply to the topic will be considered. The contest is considered closed at 11:59 PM Eastern Standard Time on January 1st, 2011. All posts/entries received after the deadline will be considered ineligible. The winning post will be selected on January 2nd and the winner contacted through Facebook. The winner will have 24 hours to respond and provide a valid US shipping address. If no response is received in the allotted time period, a new winner will be drawn and the process repeated. A HUGE thanks goes out to the people at LG Electronics at their PR group for making this contest possible. Microsoft has gone all out in making an impact with Windows Phone 7, with lots of marketing an exposure. However, the operating system is only a part of the overall phone equation. Windows Phone 7 did see the launch of a number of new devices from hardware manufacturers as well. While Microsoft’s “Chassis” approach with strong hardware criteria has made for great similarities for Windows Phone 7 devices on the inside, there is still room for innovation and differentiation from manufacturers. The initial launch of Windows Phone 7 has seen a variety of features in the initial wave of devices in terms of screen sizes, sound capabilities and other amenities. One example of differentiation can be found in the LG QUANTUM. 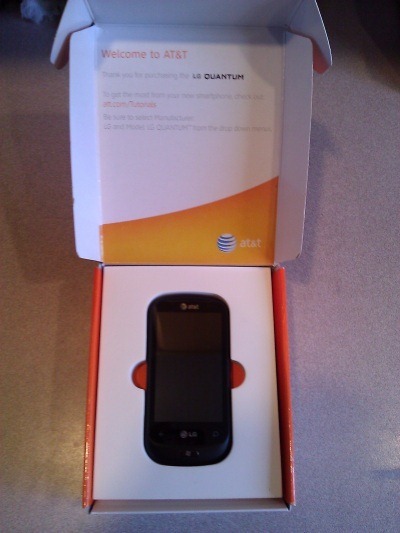 The QUANTUM is the AT&T-branded version of LG’s OPTIMUS 7 line. The folks at LG were good enough to contact me a short time back, offering me the opportunity to try out the LG QUANTUM for review. 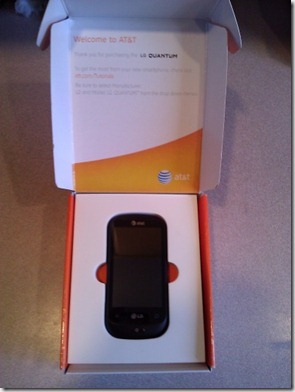 Having already had Windows Phone 7 experience, I was intrigued by what the QUANTUM had to offer. After using this phone for a while, I can say that there is quite a bit in the offering for those desiring certain features and functionality out of their Windows Phone 7 device. The kitting was pretty much a standard AT&T offering, with standard branding in logos and colors. The first thing I noticed about the LG Quantum was the actual material makeup of the exterior. Personally, I have noticed a continuing trend from phone manufacturers towards the “shiny and smooth” approach with hardware. While this may be visually appealing, I constantly get the feeling with many devices that I am one small mistake away from the device slipping (or shooting if I squeeze too tightly) out of my hands. This is far from the case with the LG QUANTUM. The outer surface, especially along the sides, is designed for better gripping. Holding the device in my hands for the first time, I felt far more confident that the phone would not end up on the floor. 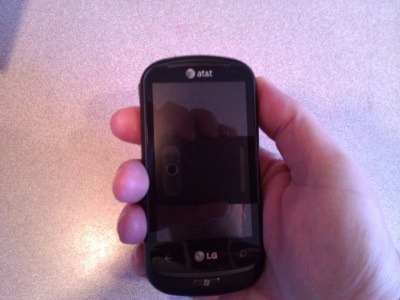 The size of the phone makes for a nice fit in my (and I presume most peoples’) hands. My recent phone experience has been with phone that include large screens. While this makes for a nice viewing experience, it can make for an awkward experience when simply holding the phone or using the phone as a phone itself. Considering the fact that I have somewhat larger hands than most, I can imagine that a large-screen device could be even more uncomfortable experience for many. This is definitely not the case with the LG QUANTUM. The phone fits nicely in the hand and, when combined with the gripping nature of the exterior surface, makes for a pleasant experience. The general feel of the LG QUANTUM is quite solid. While the device feels somewhat heavier than other phones I have worked with recently, it does not feel bulky. Of course, some of the additional weight can be attributed to the addition of a physical keyboard (more on that shortly). 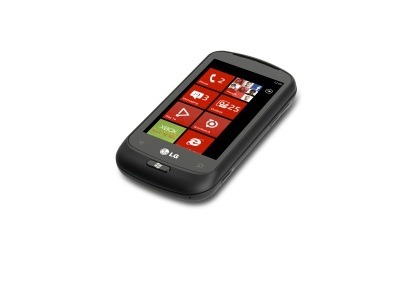 From a Windows Phone controls perspective, the LG QUANTUM is designed with a physical hardware button for the Windows Start screen, and two touch-sensitive areas for the “Back” and “Search” functions. I do have to say that this takes some getting used to. With no tactile feedback for these two buttons, I often had to look at my device in order to touch in the correct place. The LG QUANTUM also includes standard buttons for volume control (on the right-side of the phone), camera (on the right-side of the phone) and power/screen toggle (on the top of the device). LG chose a very “low-profile” approach with these buttons. While this makes the buttons less intrusive and less prone to accidental touches, it does make for some “trial and error” if trying to manipulate the buttons without looking at the device. The biggest case in point for this is the power button, which I found myself having to visually locate at times. The LG QUANTUM also includes a cover for the microUSB port (on the upper left-side of the device). In a totally personal opinion, I tend to find these covers a bit annoying. While they do provide for nicer aesthetics and some protection, my experiences with these types of covers is that they eventually wear out and break off. Overall, I found the hardware packaging to be quite nice. The device is easy to hold and very “pocketable” as well. A major differentiator for the LG QUANTUM is the addition of a physical slide-out keyboard. The keyboard slides in and out smoothly and easily. The keyboard includes full QWERTY alpha support, with numeric and special character keys accessible via a Function button. The keys are of the “chiclet-style” variety, allowing for reasonable tactile response. The Function and Uppercase keys are on the left-side of the keyboard and are a bit different. They are small, round and metallic buttons. One item I noted was that when the keyboard was slid out, the overall weight and balance of the phone still felt very good. 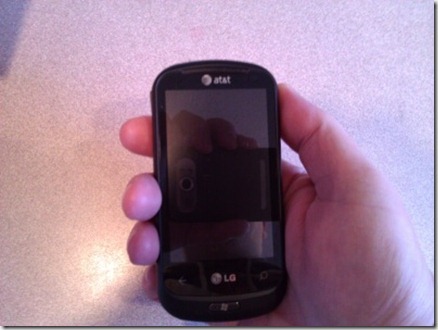 In many phones I have used in the past, sliding out the keyboard made the phone feel very unbalanced in my hands. As a result, I had to be extra careful to grip the keyboard area of the phone to avoid the entire phone flipping out of my hand. This was definitely not the case with the LG QUANTUM and was a big plus in my mind. 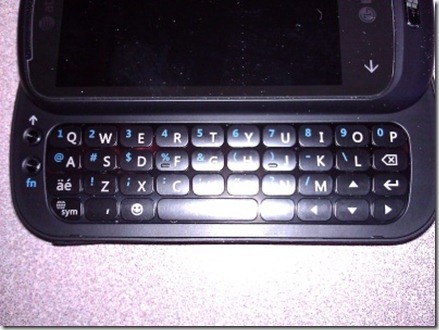 There was a time where I basically demanded a physical keyboard for my phone. With recent advances in on-screen keyboards and larger screens, I have been less demanding in this area. However, I did find that the LG QUANTUM keyboard was very easy to use (with one exception). The keys were easy to tap and the feedback was good. My only difficulty was with the Function and Uppercase keys. In addition to being quite small, they were another example of being “low-profile” and made for a difficult time in hitting. Aside from this, I can say that I generally liked the LG QUANTUM keyboard and became quite comfortable using it. If a physical keyboard is a hard and fast requirement for a Windows Phone 7 buyer, the LG QUANTUM should meet those requirements quite nicely. As I noted earlier, I have become quite used to using larger screen devices as of late. This being the case, I had some initial reservations about using a device with a smaller screen (the LG QUANTUM has a 3.8-inch screen). However, I found the screen to be very readable and usable. Thanks to the nature of the Windows Phone 7 OS, touch areas for navigation were easy to use and performed well. The screen is also very viewable in outdoor lighting. As phones become more and more of an “on-the-go” photo-taking device, using the camera and resulting picture quality is of greater importance to a lot of users. The LG QUANTUM ships with a 5 megapixel camera. As is the case with all Windows Phone 7 devices, the hardware leverages the standard Windows Phone 7 camera interface. I found the picture quality of the LG QUANTUM to be quite good. Snapping a photo in standard lighting resulted in good picture quality. 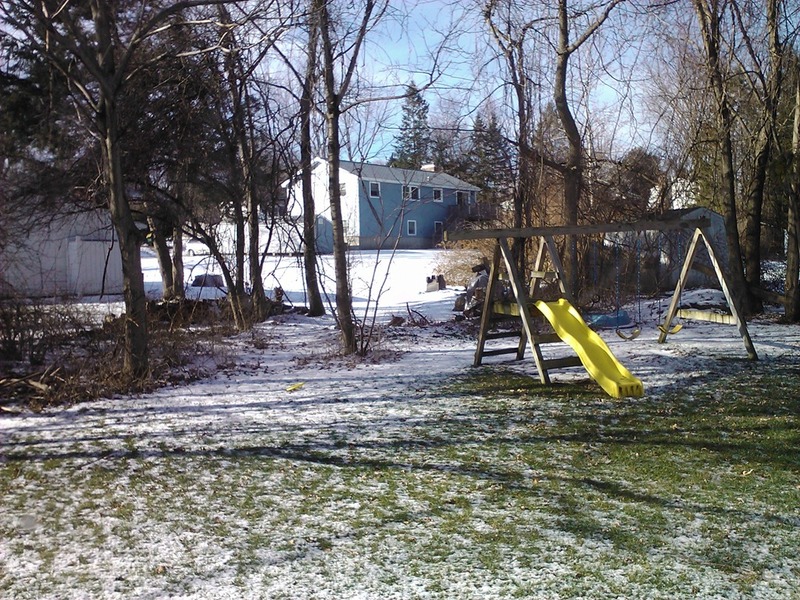 The picture below is left in it’s default resolution; click on the image for the full version. While I am someone who has never looked to replace a true camera with a phone, I do believe that the LG QUANTUM more than suffices for taking photos when you’re camera simply isn’t available. Between the general camera quality and Windows Phone 7’s ability to go straight to the camera interface with just a push of the camera button even when the phone is locked, I found it easy to take quick snapshots “on-the-fly” that I wouldn’t have been able to do even with a regular camera. For me, one huge advantage of the Windows Phone 7 platform has been the inclusion of Zune integration. While other platforms have media integration, Zune adds Zune Pass functionality, allowing me to stream any music from the Zune Marketplace directly to my Windows Phone. As a result, I am finding myself using my phone as my primary media device for the first time (I previously used Zunes separate from my phone for my audio and video). The standard headset shipped with the LG QUANTUM was adequate for my audio needs. If you are an audiophile, they may simply not be enough for your taste. The good news, however, is that you can use any 3.5mm headset for a better audio experience. Headset aside, the music experience is very good. I love the Zune-like interface for playing audio and video on the LG QUANTUM. I have used many phones and many interfaces (both stock and 3rd party), but the Zune interface is still my personal favorite. Video playback is also good. I was able to easily transfer purchased video content from the Zune Marketplace to the LG QUANTUM and play on the device. The playback was smooth and crisp. 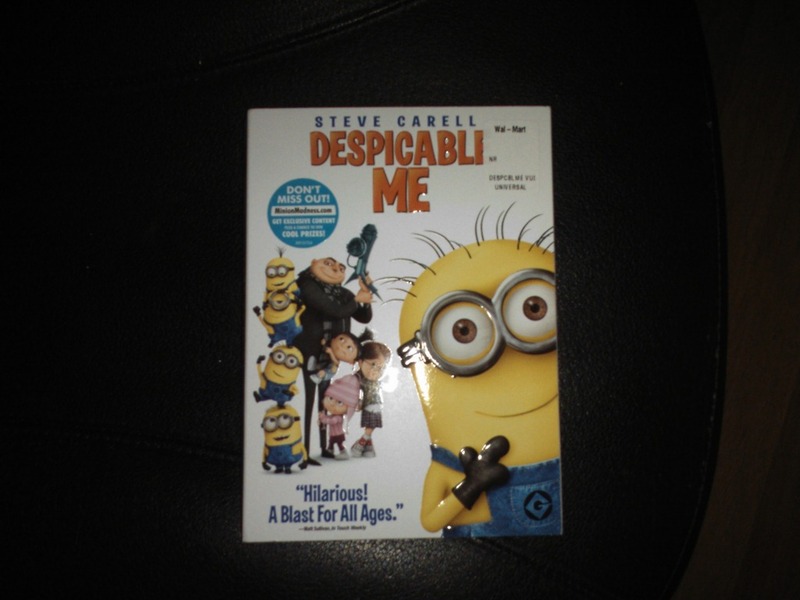 I also was able to easily transfer other video content to the device and play with the same results. I will admit that the smaller screen is not the most ideal medium for watching video, but the LG QUANTUM screen is no smaller than the Zune HD and I was comfortable watching video on that device on a regular basis. The LG QUANTUM does include another interesting feature – DLNA support. If you have watched the “Swamp Creature” commercials here in the US recently (where the homesick swamp creature looks at photos, watches videos and listens to the sounds of the swamp on other devices straight from his phone), you have some idea of what DLNA is about. Basically, DLNA allows for the streaming of content via WiFi to devices that also support DLNA. While I do not have any TVs or audio players with DLNA support, I do have two devices that do – a PC with Windows 7 and an Xbox 360. DLNA support in Windows Phone 7 is provided through Windows Media Player, and Xbox 360 support is indirect (using the Windows Media Center Extender functionality to view the content streamed to the PC from the LG QUANTUM). I tried out the DLNA functionality and have to admit it is quite cool. LG provides an application (“PlayTo”) on the phone. Simply open the application while your phone is connected to your WiFi network, and the application locates the DLNA-enabled devices also connected to the network. Pick a device, select the content and viola! – your media appears. I found the performance of this to be very good. Overall, the combination of Windows Phone 7 and LG functionality (both hardware and software) makes for a compelling media experience. I have talked about performance in the context of some of the specific functionalities of the LG QUANTUM. A couple of other areas of performance should be noted, however. First off, I have to talk about battery life. This is one area where I was extremely impressed. Generally speaking, battery life was very good. Average usage, with multiple email accounts using Exchange ActiveSync push, frequent Internet access and moderate phone usage (approximately 1 – 1.5 hours usage) found me with approximately 50% battery life after about 10 hours. When you compare this to my past devices, this is really amazing. When you add in the fact that I was using a 2G network (I am on T-Mobile and the LG QUANTUM radio does not support the 1700 MHz 3G spectrum), good battery life is exactly the opposite of older phones without some intervention. In the past, a phone capable of 3G running on a 2G network would constantly search for a 3G connection, greatly draining the battery (Note: Some phones provided the capability of turning off the attempts to find a 3G network to alleviate the issue). My use of the LG QUANTUM with just 2G and the resulting battery life was a very pleasant surprise. From a performance perspective, my other observation about the LG QUANTUM is – things just work. Pairing a Bluetooth headset – no problem. Using WiFi – no problem. Using voice-activated calling – no problem. This may not sound like much, but it is a testament to both Microsoft and LG that the basic functionalities work without the need for advanced tools or customizations. 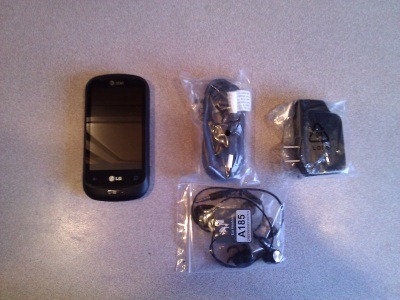 In addition to the standard Windows Phone 7 software, the LG QUANTUM for AT&T does ship with some additional software. On the AT&T side, there are a few applications available. Most notable is the offering of AT&T U-verse Mobile, providing access to a lot of video content. Unfortunately, I was not able to try this out. In addition to the PlayTo software for DLNA, LG also provides access to the LG Apps Store from within the Marketplace application on the phone. There are a number of useful and entertaining applications to be found here and (as of this writing) all are FREE to LG QUANTUM users. The additional software does make for a nice “value-add” when considering the purchase of an LG QUANTUM. 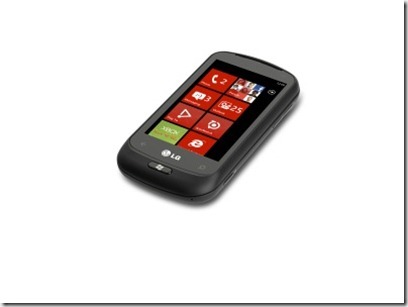 The initial launch of Windows Phone 7 brought with it a number of new devices. Based on performance and features, the LG QUANTUM rates as one of the most compelling of this first wave of hardware. If a well-built phone with a physical keyboard and solid battery life is what you crave, the LG QUANTUM has to be at the top of your list. 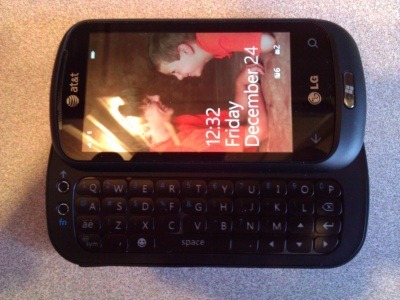 I highly recommend you take the time to look closely at this phone if Windows Phone 7 is on your wish list.